From the Division of Neurology (A.S., J.G., K.R., D.R.L., J.A.P. ), Department of Pediatrics, Children's Hospital of Philadelphia, PA; Clinical and Experimental Neuroimmunology Program (T.A. ), August Pi i Sunyer Biomedical Research Institute (IDIBAPS), Hospital Clínic, University of Barcelona; Pediatric Neuroimmunology Unit (T.A. ), Department of Neurology, Sant Joan de Deu Childrens Hospital, University of Barcelona, Spain; and Department of Neurology (D.R.L., J.A.P. ), Perelman School of Medicine, University of Pennsylvania, PA. Objective To determine whether there is an association between nonencephalitic herpes simplex virus 1 (HSV-1) infection and anti-NMDA receptor encephalitis (anti-NMDARE). Methods Antibody testing was performed using samples from 2 cohorts in a case-control observational study. The cohort “Philadelphia” included 16 serum samples of pediatric anti-NMDARE cases and 42 age-matched controls with other neuroinflammatory disorders studied at the Children's Hospital of Philadelphia and University of Pennsylvania. The cohort “Barcelona” contained 23 anti-NMDARE patient samples and 26 age-matched participants with other neuroinflammatory disorders studied at IDIBAPS-Hospital Clinic, University of Barcelona. The presence of HSV-1 IgG antibodies was examined by ELISA. As an additional control, IgG antibodies to cytomegalovirus (CMV) and Epstein-Barr virus viral capsid antigen (EBV-VCA) were determined. Results In each cohort, more participants with anti-NMDARE than controls had anti-HSV-1 IgG antibodies. In the Philadelphia cohort (58 participants), 44% of anti-NMDARE cases had antibodies to HSV-1 compared with 14% controls (OR 4.67, 95% CI 1.3–17.3, p = 0.031). In the Barcelona cohort (49 participants), 52% of participants with anti-NMDARE had antibodies to HSV-1 compared with 31% of controls (OR 2.45, 95% CI 0.7–7.9, p = 0.155). Overall, 49% of anti-NMDARE cases have antibodies to HSV-1 in these 2 combined cohorts compared with 21% of controls (Mantel-Haenszel OR 3.21, 95% CI 1.3–7.7, p = 0.007). Conclusion Past HSV-1 infection was found in significantly more anti-NMDARE cases than controls. This suggests a meaningful association between nonencephalitic HSV-1 infection and development of anti-NMDARE. Anti-NMDA receptor encephalitis (anti-NMDARE) is a recently described autoimmune encephalitis associated with psychosis, seizures, dyskinesias, hypoventilation, and autonomic instability, attributed to antibodies against the GluN1 subunit of the NMDA receptor (NMDAR).1 This disorder is now the most commonly identified nonviral cause of encephalitis.2 In approximately 50% of teenage girls and adult women with the disorder, it is triggered by an NMDAR-expressing ovarian teratoma.3 By contrast, greater than 90% of young girls or males with the disorder have no identified trigger, although it may be associated with viral infection.4 Approximately 10%–25% of patients with herpes simplex virus 1 (HSV-1) encephalitis have an immune-mediated relapse associated with GluN1-specific antibodies and anti-NMDARE symptoms.4,5 The association of nonencephalitic HSV-1 infection with anti-NMDARE has not been examined. To investigate the possibility that nonencephalitic HSV-1 infection could trigger the production of anti-NMDAR antibodies, this study examined HSV-1 seropositivity in 2 participant cohorts, with and without anti-NMDAR encephalitis, to ascertain if an association exists between nonencephalitic HSV-1 infection and anti-NMDARE. Cases were identified by neurologist diagnosis following review of clinical information (table) combined with results of anti-NMDAR antibody testing from serum sent to neuroimmune repositories at the Hospital of the University of Pennsylvania, the Children's Hospital of Philadelphia, or University of Barcelona. Sera from the Children's Hospital of Philadelphia (CHOP) and University of Pennsylvania (UPenn) repositories were combined into 1 cohort (Philadelphia). Sera from the University of Barcelona were analyzed as a separate cohort (Barcelona). We identified case sera from children aged 0–11 years deposited in the Philadelphia repositories between 2008 and 2011 and from children aged 0–17 years submitted between 2008 and 2017 in the University of Barcelona repository. Children with a known tumor or with IV immunoglobulin treatment before sample collection were excluded. We identified 39 combined cases fulfilling these criteria, 16 from the Philadelphia cohort and 23 from the University of Barcelona. The mean age of the combined cohorts was 9.0 ± 4.7 years (range 1–17 years). The Philadelphia cohort contained children with a mean age of 6.8 ± 3.1 years, and the Barcelona cohort contained children with a mean age of 10.6 ± 5.0. To limit sampling bias, 68 age-matched controls with other potential neuroimmune disease were identified from the same repositories. From Philadelphia, 43 controls were identified, and 1 was seropositive for HSV2 IgG and was excluded. Included controls had a mean age of 7.9 ± 2.4 years. From the University of Barcelona, 26 controls were identified with a mean age of 10.5 ± 5.2 years. No participants had known HSV encephalitis. Samples were collected in accordance with the guidelines of Institutional Review Boards of the CHOP, UPenn, and University of Barcelona. Informed consent was obtained from each participant. The following commercially available solid-phase ELISA kits were used according to the manufacturer's instructions: HSV-1 IgG (20-HSGHU-E01, ALPCO and ab108737, Abcam), HSV2 IgG (20-H2GHU-E01, ALPCO and ab108739, Abcam), CMV IgG (GD84, Genesis Diagnostics/ALPCO and ab108724, Abcam), and EBV-VCA (ab108730, Abcam). All HSV-1 IgG-positive samples were screened for HSV2 IgG. Results were determined by comparison with positive, negative, and cutoff controls. Sera with values greater than 10% of the cutoff control were considered positive. Sera was assayed and analyzed with masked case/control designation. Statistical analyses were performed using STATA/GraphPad. Missing variables were excluded from analysis. The Fisher exact test was used to compare categorical variables, with a significance level of 0.05. Continuous variables were analyzed using the Wilcoxon rank-sum test. Data from cohort combination are presented as a Mantel-Haenszel–adjusted OR. A significantly higher number of anti-NMDARE cases had IgG antibodies against HSV-1 (44%; 7/16) compared with age-matched controls (14%; 6/42), leading to an OR of 4.66 (95% CI 1.3–17.3, p = 0.031) (figure). The mean age of anti-HSV-1 IgG-positive and -negative participants was not significantly different. Samples from anti-NMDARE cases or controls from 2 cohorts were tested via ELISA for immunoreactivity to viral antigens. Samples were tested for IgG antibodies to HSV-1 and, as a control, IgG antibodies to CMV and EBV-VCA. (A) In 1 cohort from the neuroimmune repositories at the Children's Hospital of Philadelphia and the University of Pennsylvania, 44% of anti-NMDARE cases were seropositive for HSV-1 IgG compared with 14% of age-matched controls (p = 0.031, Fisher exact test). 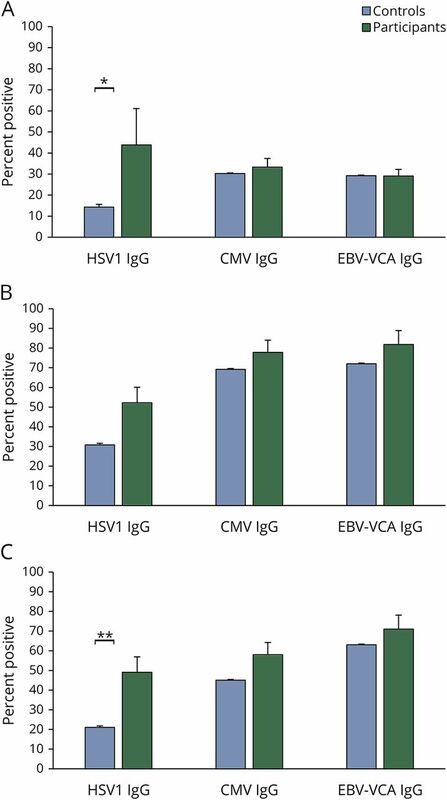 There was no difference in IgG positivity between cases and controls for either CMV (33% cases and 30% controls) or EBV-VCA (29% cases and 29% controls). Data are presented as percent positive samples with error bars indicating 95% CIs. (B) In a second cohort from the University of Barcelona, anti-NMDARE cases were more likely to be HSV-1 IgG positive (52% of anti-NMDARE cases compared with 31% of age-matched controls, p = 0.155, Fisher exact test). There was no difference in IgG positivity between cases and controls for either CMV (78% cases and 69% controls) or EBV-VCA (82% cases and 72% controls). (C) Overall, when the cohorts are combined together, anti-NMDARE cases were significantly more likely to be HSV-1 IgG seropositive (49% of anti-NMDARE cases compared with 21% of age-matched controls, p = 0.007). There was no difference in IgG positivity between cases and controls for either CMV (58% cases and 45% controls) or EBV-VCA (71% cases and 63% controls). *p < 0.05; **p < 0.01. CMV = cytomegalovirus; EBV = Epstein-Barr virus; HSV = herpes simplex virus; NMDARE = NMDA receptor encephalitis; VCA = viral capsid antigen. Compared with age-matched controls, a higher number of anti-NMDARE cases had IgG antibodies against HSV-1. Fifty-two percent (12/23) of cases had HSV-1 IgG antibodies, whereas 31% (8/26) of controls were HSV-1 IgG positive (OR 2.46, 95% CI 0.8–7.9, p = 0.155) (figure). Although there was no statistical difference, the trend in this cohort matches that of the Philadelphia cohort. Combination of the 2 cohorts reveals that an overall 19 (49%) of 39 anti-NMDARE cases were seropositive for HSV-1 IgG (figure), significantly higher than age-matched controls (14/68 [21%], Mantel-Haenszel–adjusted OR 3.21, 95% CI 1.3–7.7, p = 0.007). The mean age of HSV-1 IgG-positive and -negative participants was not significantly different. To control for the possibility that nonspecific antibody elevation in case sera could yield false positives on ELISA, we also tested for immunoreactivity to cytomegalovirus (CMV) and Epstein-Barr virus (EBV), infections without known anti-NMDARE association. CMV and EBV-VCA IgG seropositivity did not differ between anti-NMDARE cases and controls in either cohort, although the number of participants positive for CMV and EBV-VCA IgG antibodies was higher in the Barcelona cohort than that in the Philadelphia cohort (Philadelphia—CMV: 5/15 [33%], EBV: 9/16 [30%]; Barcelona—CMV: 14/18 [78%], EBV: 18/22 [82%]) (figure; Philadelphia—CMV: OR 1.2, 95% CI 0.32–4.05, p = 0.823, EBV: OR 1.0, 95% CI 0.3–3.2, p = 0.999; Barcelona—CMV: OR 1.6, 95% CI 0.39–6.24, p = 0.532, EBV: OR 1.8, 95% CI 0.4–7.0, p = 0.505). In this study, anti-NMDARE cases had a higher prevalence of HSV-1 IgG antibodies than age-matched controls in two separate cohorts. Antibodies to unrelated viruses (CMV and EBV-VCA) were not elevated in anti-NMDARE participants, suggesting that this finding is selective for HSV-1. HSV-1 IgG seroprevalence is greater than 60% by mid-adulthood.6 Therefore, we evaluated the association between HSV-1 infection and anti-NMDARE in children, in which reported HSV-1 IgG seroprevalence is only 26% at age 7 years.7 The rate of positive HSV-1 IgG antibodies detected in our participants with anti-NMDARE is elevated compared with this population statistic and the age-matched control group described here. In this retrospective study, with limited demographic information available, we were unable to control for race or socioeconomic status. However, HSV-1 seropositivity in anti-NMDARE participants was greater than that reported for any demographic group in this age range.7 Prospective studies may better control for demographic factors to confirm this finding. The development of anti-NMDAR immunoreactivity following HSV encephalitis has been hypothesized to result from HSV-mediated brain injury that exposes NMDARs to the immune system, triggering an immune response.4 However, none of our anti-NMDARE participants with HSV antibodies had clinically evident HSV encephalitis. The present data suggest an alternate disease mechanism, such as molecular mimicry, in which an epitope expressed by HSV is structurally similar to a portion of the NMDAR. Shared epitopes between HSV-1 and disease specific autoantigens have been implicated in neuroimmune conditions including myasthenia gravis.8 Alternatively, HSV infection may alter NMDAR expression, even outside the CNS, in a way that makes the receptor more immunogenic. For example, HSV-1 has been reported to “disarm” the unfolded protein response.9 Increased expression of misfolded proteins may result in recognition by autoreactive immune cells.10 Finally, HSV-1 could modulate the immune system in a manner that allows inappropriate recognition of native NMDARs. The present data suggest that nonencephalitic HSV-1 infection may trigger the subsequent development of anti-NMDARE. Prospective studies are needed to determine the timing of anti-NMDARE onset after nonencephalitic HSV-1 infection, along with mechanistic studies evaluating the mechanism by which such events are involved in disease pathogenesis. Amy Salovin: study concept and design, acquisition of data, analysis and interpretation of data, and manuscript preparation. Jason Glanzman, Kylie Roslin, and Thais Armangue: acquisition of data and analysis and interpretation of data. David R. Lynch and Jessica A. Panzer: study concept and design, analysis and interpretation of data, study supervision, and critical revision of the manuscript for intellectual content. Study funded by the NIH (R21NS088148-01-02). A. Salovin, J. Glanzman, and K. Roslin report no disclosures. T. Armangue received research support from the Mutua Madrileña Foundation. D.R. Lynch is an associate editor of the Journal of Neurogenetics; holds a patent for creation of test for anti-NMDA receptor encephalitis; consulted for Bracket Incorporated; and received research support from Edison Pharmaceutical, Shire Pharmaceutical, Reata Pharmaceutical, Horizon Pharma, and the NIH. J.A. Panzer is deceased (no disclosures are included for this author). Full disclosure form information provided by the authors is available with the full text of this article at Neurology.org/NN. The authors thank Dr. Josep Dalmau (University Pennsylvania and University Barcelona) for his critical review of the manuscript and the Children's Hospital of Philadelphia Biostatistics and Data Management Core for statistical consultation.
. Anti-NMDA-receptor encephalitis: case series and anlysis of the effects of antibodies. Lancet Neurol 2008;7:1091–1098.
. The frequency of autoimmune N-methyl-d-aspartate receptor encephalitis surpasses that of individual viral etiologies in young individuals enrolled in the California encephalitis project. Clin Infect Dis 2012;54:899–904.
. Trends in herpes simplex virus type 1 and type 2 seroprevalence in the United States. JAMA 2006;296:964–973.
. Seroprevalence of herpes simplex virus type 1 in children in the United States. J Pediatr 2007;151:374–377.
. Molecular mimicry and myasthenia gravis. An autoantigenic site of the acetylcholine receptor alpha-subunit that has biologic activity and reacts immunochemically with herpes simplex virus. J Clin Invest 1989;84:1174–1180.
. Herpes simplex virus-1 disarms the unfolded protein response in the early stages of infection. Cell Stress Chaperones 2012;17:473–483.
. The endoplasmic reticulum stress response in immunity and autoimmunity. Nat Rev Immunol 2008;8:663–674.